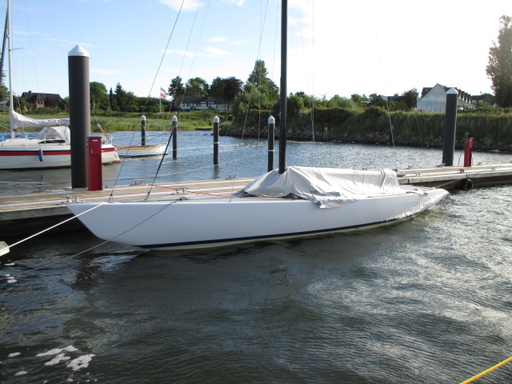 This 5.5m boat has been absent from the 5.5m racing environment, for quite some time. The boat has reached Northern Germany, recently. With a new shiny varnish she looks pretty again and will be tested, possibly a regatta will follow, before refit continues over winter. NOR 47, USA 91, NOR 50, GER 75, USA 94, SUI 184, USA 96, NOR 54, SUI 176, NOR 56, SUI 202, NED 10, NOR 58, BAH 16, SUI 155, SUI 160, SUI 171, SUI 172 and GER 25. NED 10 was lost in a fire; USA 91, 94 + 96 are not found again, yet and BAH 16 is told to have gone to a US-based sailing school. For SUI 135, FRA 44 and the remaining Melges boats it will be a challenge to meet again, for close competition races. Gentlemen, on your marks! Warren Muir reports: This boat built by Keith Revell was made from fiberglass and was made from the same mold form as KA 38.